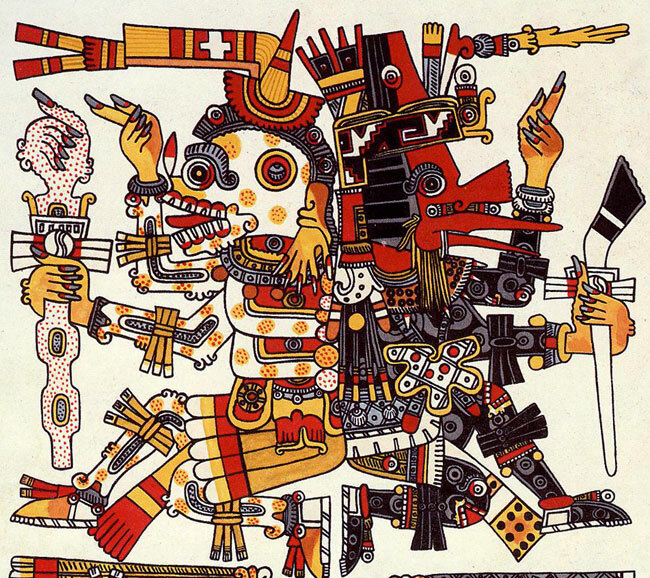 The creation of the fifth sun, the current age, fell to Quetzalcoatl and Tezcatlipoca (top picture). In one version of this myth, the two gods found the earth completely covered with water from the flood that ended the fourth sun. The giant earth monster Tlaltecuhtli (‘Earth Lord’ - pic 1), a crocodile-like creature, swam in the sea searching for flesh to eat. The gods turned themselves into serpents, entered the sea, and tore Tlaltecuhtli in half. The upper part of her body became the land, and the lower part was thrown into the sky to become the stars and heavens. Plants and animals grow from the back of Tlaltecuhtli and rivers pour from her body. But his shell horn had no holes. 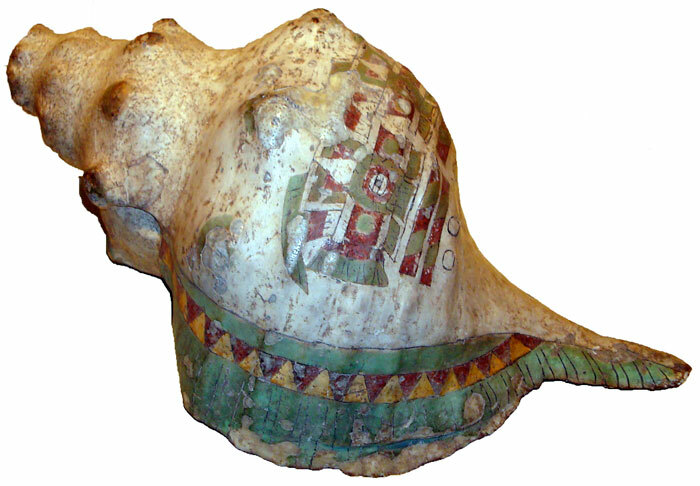 The false conch horn was the first of several tricks that Mictlantecuhtli used to block Quetzalcoatl’s mission. Quetzalcoatl called upon worms to drill a hole in the shell, and bees to make the horn (pic 3) play. 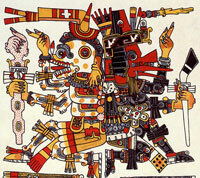 When Mictlantecuhtli heard the horn, he at first allowed Quetzalcoatl to gather the bones, but later changed his mind. His helper spirits dug a hole, and a quail appeared and startled Quetzalcoatl, who tripped and lost consciousness. The bones were scattered and broken, and the quail chewed on them. Quetzalcoatl finally rose, gathered up the bones, and escaped from Mictlan. 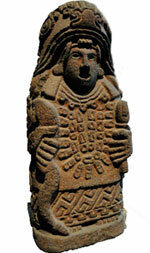 Quetzalcoatl carried the bones to Tamoanchan, a place of paradise. The old goddess Cihuaoatl (‘Woman Serpent’ - pic 4) ground them on the metate [grinding stone] and placed the powder in a jade bowl. Quetzalcoatl and the other gods gathered around and shed their blood upon the ground bones, and the first people of the fifth sun were made. NOTE. Because Quetzalcoatl dropped the bones and they broke, human beings ended up different sizes! • Pix 3 and 4: photos by Ian Mursell/Mexicolore. Learn more about the conch horn and hear its sound!